I love cooking and then food blogging about what I made. As honorable as sharing my kitchen adventure is to others may be, I realized that my primary motivation is selfish. Whenever I take on a new dish, it usually involves looking at several recipes online and then based off my own likes, dislikes and equipment, coming up with my own variation. If my variation works, I document everything and take photos. Then I publish to this blog in the Recipe category. Now the next time I go to make the dish, I go to my own website without having to repeat the research I did the first time. The recipe section of the site is my own version of the family recipes that used to reside on index cards. In cases where I don’t make any alternations, I might just take photos and provide a direct link to the source. This is also saving me time as I don’t need to go back to the search engine to locate the recipe that I already know I like. As great as Google Search may be, when it comes to recipes they favor larger sites with more cluttered design and recipes of unnecessary complexity. I much prefer getting recipes from the independent blogger than some celebrity chef. There is less noise. The recipe is less likely to try an up sell me on something I don’t need. So when I search recipes online, I almost always jump down to about the 10th spot in the search results and start my research there. 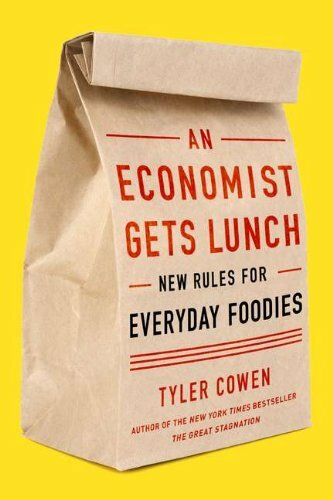 In the outstanding book An Economist Gets Lunch: New Rules for Everyday Foodies, author Tyler Cowen goes into greater depth on why getting recipes from celebrity chefs is usually a bad idea. It is in the economic interest of a top chef not to make their dishes too easy to replicate. They tend to have more ingredients and steps than most. The more complex the recipe, the more likely something might go wrong and worse is you might not be able to figure out what caused the dish to turn out poorly. Simple recipes are better for learning and can often yield equal results in terms of quality. This is why I’ll favor an independent blogger like dishes and dishes over someone with a show on The Food Network. Another reason I post the recipes online is the instant feedback I get in comments. These tips and suggestions help me become a better cook at a faster pace. When my attempt at cooking pig uterus came out rubbery, Terri added an excellent comment guiding me in the correct direction the next time I make this dish. Even though I rarely will update older posts, that rule doesn’t extend to recipes. As I improve upon a dish, I will go back and make updates to those posts. In April 2012 I made quite a few changes to my July 2011 recipe for Dill and Caraway Sauerkraut. If you are learning to cook, I highly recommend getting a camera and starting a blog. Use the free service offered by WordPress.com. Your blog will become your personal recipe drawer. Then sharing recipes with friends and family is as simple as emailing a link.